After the men who were carrying the Ark of the Lord had gone six steps, David sacrificed a bull and a fattened calf. 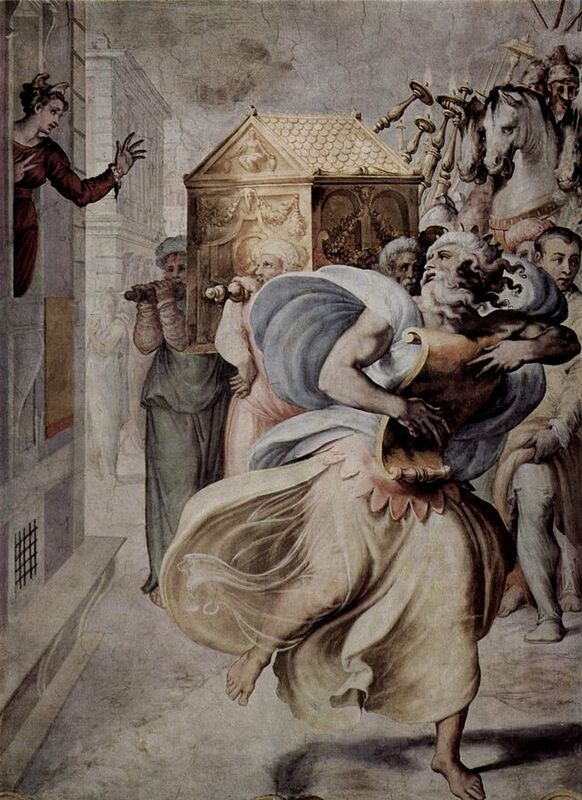 And David danced before the Lord with all his might, wearing a priestly garment. So David and all the people of Israel brought up the Ark of the Lord with shouts of joy and the blowing of rams’ horns. But as the Ark of the Lord entered the City of David, Michal, the daughter of Saul, looked down from her window. When she saw King David leaping and dancing before the Lord, she was filled with contempt for him. When David returned home to bless his own family, Michal, the daughter of Saul, came out to meet him. She said in disgust, “How distinguished the king of Israel looked today, shamelessly exposing himself to the servant girls like any vulgar person might do!” David retorted to Michal, “I was dancing before the Lord, who chose me above your father and all his family! He appointed me as the leader of Israel, the people of the Lord, so I celebrate before the Lord. Yes, and I am willing to look even more foolish than this, even to be humiliated in my own eyes! But those servant girls you mentioned will indeed think I am distinguished!” So Michal, the daughter of Saul, remained childless throughout her entire life. Back in 1 Samuel 18, we were told that Saul’s daughter Michal had fallen in love with David. She was used as a bribe in an attempt to trick David into reckless action, with Saul hoping the young man would be killed in battle. When that plot failed, Michal was given to David as his prize. After the wedding, as she looked into her new husband’s eyes, she must have been so happy. According to The New Interpreter’s Bible: “As his kingdom interests bring Michal’s story to a bitter end, David is in the dangerous position of claiming to honor the Lord while completing the final humiliation of one who had once offered him love” (vol II, page 1250). David is considered the greatest king of Israel. He is called “a man after God’s own heart” (1 Samuel 13:14). And yet is is also a flawed man, who ended up hurting a person he should have gone great lengths to protect: his wife. How do you keep the practical demands of your life from overshadowing the personal?